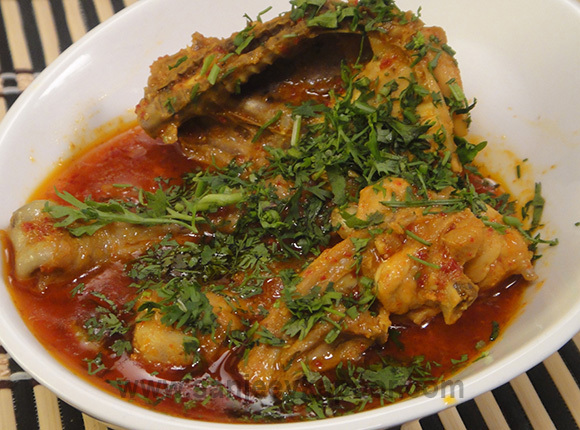 A Goan classic dish – traditionally they use pork for this, but with chicken it tastes just as delicious. Mix chicken pieces with salt and turmeric powder and set aside to marinate. Put dried red chillies, cinnamon, garlic, coriander seeds, cumin seeds and ginger in a mixer jar. Add some water and malt vinegar and grind into a smooth paste. Heat oil in a non-stick pan. Add peppercorns, cloves and green cardamoms and sauté for 2 minutes. Add onions and sauté till they are light brown. Add marinated chicken and mix well. Cook on high heat for 1 minute. Add ¼ cup water, mix well, cover and cook on low heat for 5-10 minutes or till the chicken is half cooked. Add ground paste and mix well. Add some water and mix well. Cover and cook for 5 minutes. Add potatoes, green chillies and sugar. Mix well, cover and cook for 8-10 minutes or till the chicken is completely cooked.